Conlanging and Conworlding Are &%$#@ Hard! The first reaction of most everyone who reads this will most likely be "Duh!" To this, I’d add "I know, but sometimes it just hits you like the proverbial ton of bricks." And by hard I don't simply mean difficult. What I'm specifically referring to is the urge to be original or unique in one's conlanging/conworlding efforts. Over last weekend, I was out at our local Borders buying some gifts for my son's birthday. I was picking up the Strategy Manual for the new Pokemon Black and White game for him when I noticed the manual for World of Warcraft: Cataclysm on the shelf nearby. I'm not a WoW player, but I can appreciate good artwork and fantasy-type creatures so I picked it up and started looking through it. When I got to the Tauren, I have to admit my heart sank. I’ve been aware of them, but their general resemblance to my Tylnor was suddenly much more disheartening than previously felt. (Oh, and the resemblance between the names Tylnor and Tauren is coincidental. The word Tylnor actually had a voiced stop at the beginning, but I liked the sound of the unvoiced one after all.) You be the judge on looks. Here are some images of Tauren; here is an early version of one of my Tylnor. 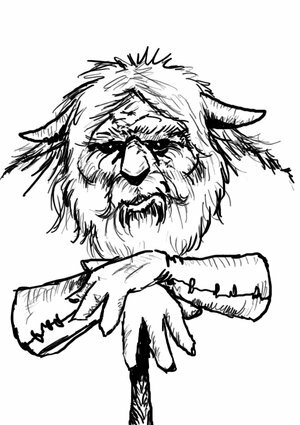 The Tylnor originally (literally almost thirty years ago) began as my world's gnomes or dwarves and evolved since then into the horned critters you see here. The most recent version came about, originally, when I thought it would be cool to have them with horns, sort of built-in (stereotypical) vikings. Turns out there’s lots of fantasy creatures with horns, so that’s not that original after all. Okay, I thought, no problem. I thought some more and thought maybe I’ll pattern them after my favorite animal: the muskox. So, recently, I’ve added a large, hair-covered boss on their heads from which their horns sweep down on either side. Tylnor arms, legs, and backs also have long, shaggy guard-hairs. I haven’t decided if they’d need to be combed annually. That might set up some interesting cultural features. In any case, the Tylnor are humanoids patterned off a bovine or caprine form (muskoxen are actually related to goats), and that picture of the Tauren just made me think %$#@&! Do I have to entirely revamp the Tylnor? I’ve even gone so far as to investigate Tylnor skeletal structure, and I think I’ve determined they have a characteristic natural hump on their back from something that might be considered kyphosis in humans along with some spines on their thoracic vertebrae to hold up their massive heads and horns. Anyway, that’s all in the planning stages. Plus, of course, the Tauren themselves aren’t even original: Minotaur anyone? Additionally, a year or so ago, I posted an image of my Drushek on ZBB and someone astutely noted "That looks like a Bothan." And, sure enough, if it didn’t, which led me at the time to say %$#@&! So, I’ve also gone back and redesigned those guys a bit, too. 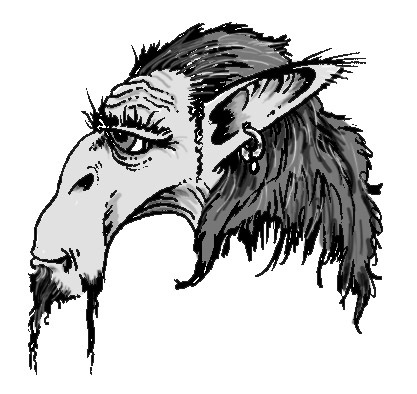 They now have a different hair-style, ears, and long thing tendrils on the corners of their mouths and chin. I haven’t decided whether their hair is more cilia-like or actual hair. They’re still hopping creatures though. I’m keeping that. And then we come to language. This is a conlanging blog after all. The shorthand for this urge to be unique/original but you’re not, is ANADEW as used on CONLANG-L. For those who don’t know, ANADEW stands for “A natlang’s already dunnit, except worse” (See here.) Even my own Dritok has parallels in reality (whistled languages, sign languages, etc.). My only claim to fame may be that I insisted on including the nasal-ingressive voiceless velar trill as a regular phoneme. Even those who try to create an a priori conlang are often constrained by what their own mouths can produce. Notable exceptions to this are Rikchik and Fith. I’m in the process of formalizing Dritok and Umod (the Tylnor’s language) and eventually Elasin (another race’s language living in the same conworld), but it gets disheartening sometimes. I’m toying with the idea of using a bilabial trill in Umod. This is a stereotypical sound a horse or cow makes, so I felt it would fit the physiology. But, on the other hand, I don’t want to go too overboard on the exotic phonetics. But, on the other hand… Well, you get the idea. In some ways, I’m hoping my having concerns like this makes me a better conlanger. At least, I’m thinking. Thanks for listening. Whine-fest over. Back to the notebooks and drawing pad! And this is just the first chapter! 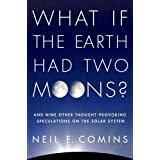 Granted, there are a number of interesting web sites in which to get similar information (e.g., World Builders), but Comins’ book provides an easily-digestible way to get the creativity flowing. He also includes new names for the alternate Earths and their moons (or lack thereof) like Dimaan (“Earth”), Kuu (“Moon”), and Lluna (the 2nd captured moon in the first chapter). He also includes brief narratives introducing each new chapter’s concepts, like a Dimaanian Galileo Galilei getting arrested by the Dimaanian Inquisition in the first chapter. Although not a conlanging resource per se, this book has the potential to serve as a jumping off point for those who want to lend the environment in which their conlangs are spoken a firm footing in (an alternate) reality. I’m already thinking of the implications of the two quotes I mentioned above.